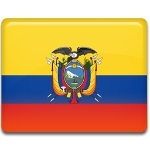 Guayaquil Independence Day is one of the public holidays in Ecuador. This holiday is observed annually on October 9, celebrating the day when the city of Guayaquil gained independence from Spain in 1820. The city of Guayaquil was founded by Spanish conquistador Francisco de Orellana on July 25, 1538. During the next two hundred years the city was attacked and looted by French and English pirates. On October 9, 1820 a group of civilians with the support by the soldiers almost bloodlessly took control over the city and declared independence from Spain. The city was called Provincia Libre de Guayaquil and representatives of Venezuelan, Ecuadorian and Peruvian pro-independence union created there a Junta de Gobierno. The declaration of independence of Guayaquil became the key victory in the Ecuadorian War of Independence and sparkled the resistance in other cities of Ecuador. The war lasted for two years and ended with the defeat of the Spanish forces in the Battle of Pichincha. The anniversary of the liberation of Guayaquil is a public holiday in Ecuador.